In the past, the best and in most cases the only useful purpose of plinths under display placements was their large communication area to convey brand-specific or product-specific images and messages. The actual inside space was used only for the cruciform support. That wasn’t enough for the Panther Group’s experts. They have now developed an entirely new approach called “Magic!”. This gives the plinth considerable additional uses: the “Magic!” display integrates a variable number of dispensers and a feed system into the base structure, in which there is now space for additional merchandise. The display is protected by a cover during transport and until it reaches the P.O.S. 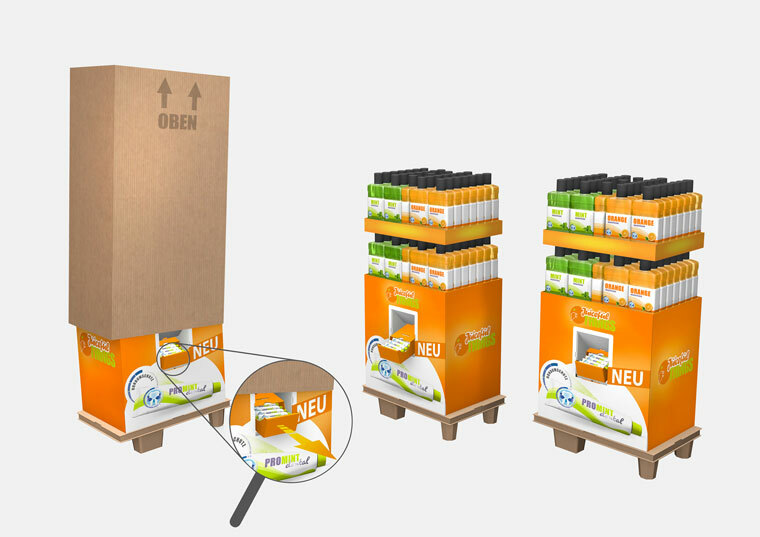 When this protective package is pulled off, a dispenser integrated into the plinth and already filled with products moves out. The dispenser is positioned at an angle on rails in a shaft, so the goods constantly slide forward by gravitational force and thus remain visible to end consumers. The innovative forward feed technique sees to it that the dispenser slides through the shaft and out of the plinth entirely by itself. The dispenser’s own weight in the unit, together with the weight of the products, ensure that more goods continuously slide forward after any are removed. The size, number or position of dispensers can be varied depending on the customer’s requirements and the specifications of the product. An alternative design variant involves locking the dispenser in the plinth to locate it flush with the plinth wall so it no longer projects outwards. Just pressing down a flap immediately locks the dispenser. Removal of goods is easy and secure with this solution as well. The basic idea of “Magic!” is adaptable in both shape and size, and can be adjusted to match a wide variety of product geometries. This makes the innovative display attractive for new product launches or for many promotion articles designed to lead to impulse purchases. Now the plinth finally has a real additional benefit. Packed with useful, simple technology to sell more goods: “Magic!” is Panther’s innovative plinth display with intelligent inner workings.